Kriste Kirshe breaks through the Ireland defense for Team USA. Just over a year ago, Kristi Kirshe was working in a Boston law office when Grace Conley, her former soccer and lacrosse teammate at Franklin High, suggested Kirshe join her on the Boston Women’s Rugby Club. Her rise in the sport since has been meteoric. The career scoring leader for the Williams College women’s soccer team, Kirshe is now a full-time contract athlete with USA Rugby. 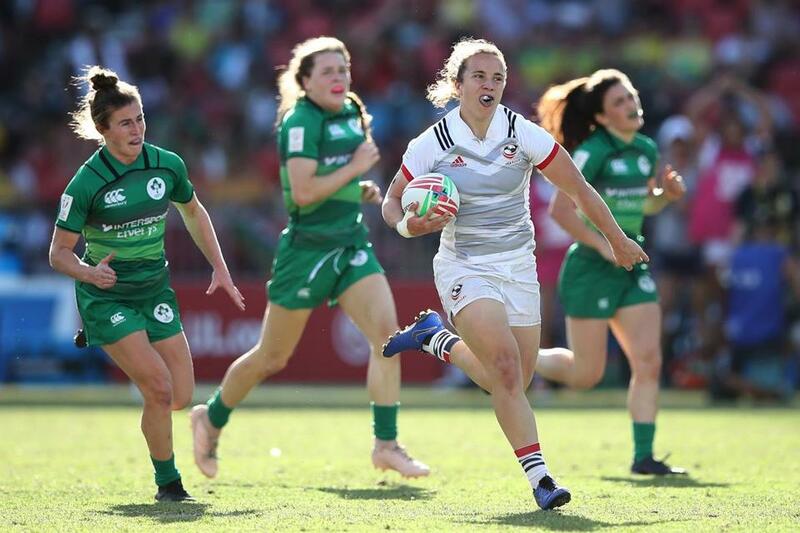 She lives and trains in Chula Vista, Calif., and made her national team debut last month for the Women’s Eagles 7’s team that won the bronze medal at a tournament in Sydney. From the center position, Kirshe scored five tries in Australia. Playing a new sport for a living at its highest level is “something I wouldn’t have dreamed a year ago,” she said. “The biggest challenge is learning strategy and tactics at a rapid pace. It’s like a crash course. A 2017 Williams grad, Kirshe, 24, said the skills acquired from previously playing soccer, basketball, lacrosse, and Pop Warner football have contributed to her success on the rugby field. Her parents, Greg and Kathy, played varsity soccer at Cornell University. Her brother, Lane, played football at Franklin High and Wesleyan University and her sister, Lindsey, was a three-sport athlete at Franklin High. The Women’s Eagles 7’s are ranked No. 2 in the world and have three tournaments remaining – the first in April in Japan – in an Olympic-qualifying year. “Rugby has been the perfect combination of every sport I’ve played,’’ said Kirshe.